* Lightly sweetened with the low-glycemic sugar maltitol, these lozenges deliver the power of Thieves®, along with the flavor of natural peppermint and lemon essential oil. * The Art skin care line is fantastic! I was very skeptical about it at first, but it will be my go to cleanser from now on! * ART® Gentle Cleanser supports healthy glowing skin by washing away impurities with a soft, gentle lather. * Infused with skin-loving essential oils, your face will feel clean and refreshed with a renewed, radiant look. * This all-natural toothpaste is made with pure, therapeutic-grade essential oils, including the cleansing and protective benefits of Thieves® essential oil blend. * Its safe and effective formula provides a fortress of support for healthy gums, strong teeth, and a confident smile. * I bought this to make DIY candles for outside! It doesn’t get too cold in South Georgia, so we spend a lot of time outside in the fall. I can’t wait to make candles for the back porch! * Citronella essential oil has a refreshing and uplifting fragrance, and can be diffused indoors or outdoors to freshen the air and eliminate odors. * Lemongrass essential oil supports overall well-being*, and may support the digestive system. * I’m stocking up on RC before the winter months get here since this is a winter time MUST HAVE! * R.C.™ is an invigorating blend of pure essential oils – including Spruce, Cypress and three varieties of eucalyptus that is relaxing when used in massage. * I’ve been out of Thieves for almost 2 weeks and it was torture! I didn’t realize how much I use this oil until I didn’t have it! * Thieves® essential oil blend was inspired by the legend of four 15th-century French thieves who formulated a special aromatic combination composed of clove, rosemary, and other botanicals they used while robbing the dead and dying. * Young Living’s one-of-a-kind Thieves blend, crafted in the spirit of that legendary combination, can be found in all of our Thieves products. * When taken internally, Thieves supports healthy immune function*, and it includes Eucalyptus radiata essential oil, which may help maintain a healthy respiratory system. * I received this as a FREE oil! * Lemon may be used to enhance the flavor of foods. * I received this as a FREE oil! This was a new oil to me so I was excited to get it and try it out! * Aroma Life™ combines the harmonizing effects of ylang ylang with known powerhouses cypress, helichrysum, and marjoram. * Deep Relief essential oil roll-on is a Young Living-exclusive blend of pure essential oils formulated to use for massage after activity. * Peppermint, Wintergreen, Copaiba, Helichrysum, Dorado Azul, and other essential oils each play an integral role in this blend. * Deep Relief Roll-On has an invigorating and energizing scent, and offers a convenient method of application for forehead, temples, and neck anytime, anywhere it’s needed. * Stress Away™ Essential Roll-On is the perfect on-the-go natural solution to combat stresses that creep into everyday life. * This deliciously unique blend of essential oils makes relieving daily stress convenient and easy. * This oil adds a bright, citrus flavor to foods and water and is a savory complement to many meats marinades, side dishes, and dressings. For the past couple of weeks, mine and Scott’s evenings have been packed. So we decided we would go to the noon class at crossfit. This way we would be able to get our workout in and do what we needed after work. Here is my only problem with that… I sweat! And I didn’t really want to spend the rest of my day stinky! I knew I had a bottle of Cottonelle cleaning cloths around that were no telling how old! So I dumped them out and decided to make my own! This is such an quick and easy DIY version using essential oils. 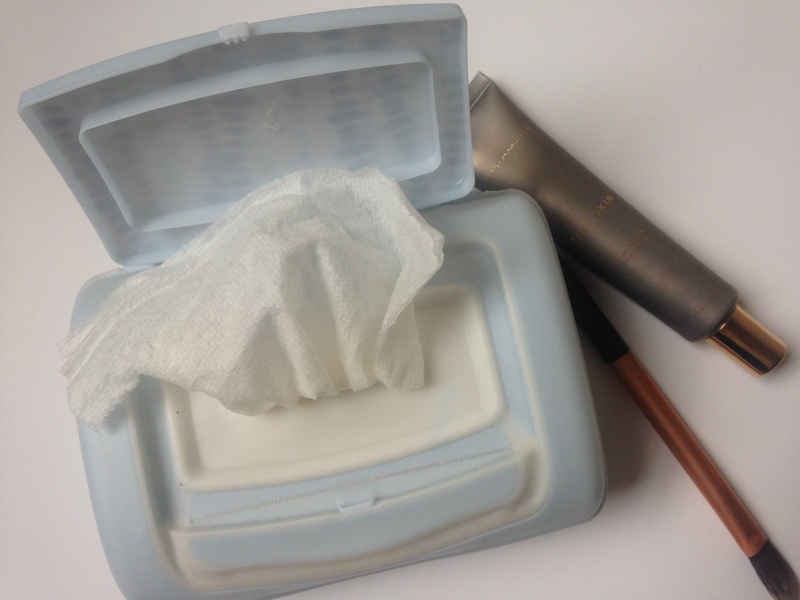 The result is a clean smelling cleaning cloth that leaves you refreshed. Store in your left over Contonelle carrying case. – I made these a week and a half a ago and they are still moist and smell of essential oils! 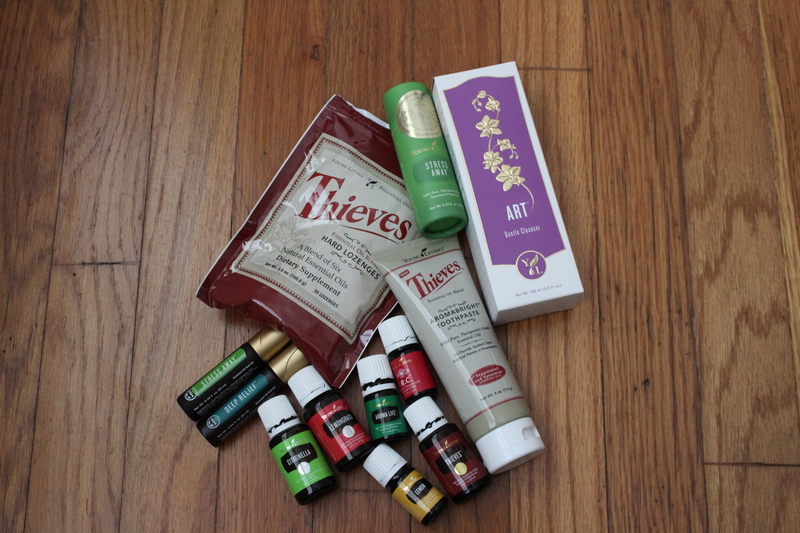 Ok-let me tell you, Young Livings Thieves products are pretty awesome! I’ve slowly been changing out our products for ones from Young Living, and I can tell I’m loving them so far. + Young Living pure essential oils—Thieves®, Jade Lemon™, and Bergamot—work with other plant-based ingredients to leave your dishes sparkling clean. Did You Know: Methylisothiazolinone is a synthetic preservative causing some scrutiny for allergies, and it is found in many “green” household products, including dish soaps. Thieves Dish Soap has no synthetics; every ingredient is naturally derived. + Thieves Laundry Soap gently and naturally washes your clothes, leaving them truly clean without any chemical or synthetic residue. + Natural enzymes and powerful essential oils add to the formula’s strength to leave your clothes fresh and clean with a light citrus scent. + Thieves Laundry Soap can be used in all washers, including high-efficiency, and its highly concentrated formula will provide around 64 loads with just 32 fl. Oz. Did You Know: Many detergents add optical brighteners to make clothes appear brighter, which has nothing to do with cleaning clothes. Clothes only appear whiter and brighter because these additives reflect blue light, giving the illusion that your clothes are less yellow. These optical brighteners remain in the clothes and are against the skin when worn. 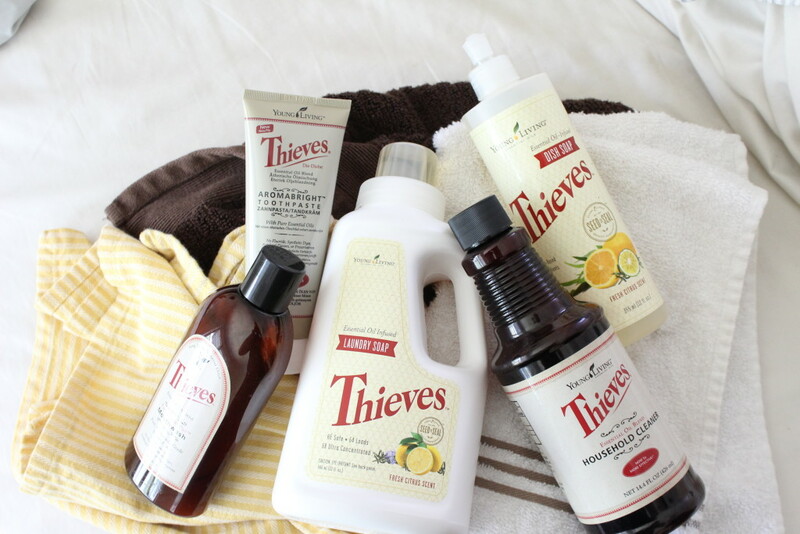 + Thieves® Household Cleaner has increased cleansing power and an even safer, more sustainable formulation. + Thieves Household Cleaner contains ingredients from renewable plant and mineral sources, vegetable-based surfactants, and even more Thieves and lemon essential oils for extra cleaning power. + This 4 oz. premium, all-natural toothpaste is made with pure, therapeutic-grade essential oils, including the cleansing and protective benefits of Thieves® essential oil blend. + Its safe and effective formula provides a fortress of support for healthy gums, strong teeth, and a confident smile. + Thieves® Fresh Essence Plus Mouthwash contains a special formulation of essential oils that provides incredibly fresh breath. + The unique liposome technology (using soy-derived lecithin) binds the essential oils to the mucous membrane inside the mouth for longer-lasting effects on teeth and gums.